Get control of your camp marketing with this framework. 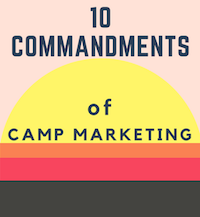 This booklet is yours for free and when you download it, you’ll also receive our monthly ‘Marketing Mondays’ Tips, each of which includes two items to help you get control of your camp marketing madness. Bonus! Access to both the Go Camp Pro email and Joanna Warren Smith's HINTS newsletter. Subscribe to get our latest resources and early access to events by email. © Copyright 2019 Go Camp Pro. All rights reserved.